“There’s no other fight he can make that he makes more money than he does fighting me – the problem is, he gets beaten by me,” Malignaggi said. “[Eddie] Hearn can easily put the fight together, [Al] Haymon can easily put the fight together, Showtime have said they’d be interested in it — I don’t think it’s a no-brainer at this point. “I don’t think it’d any secret at this point — there’s money in the fight. I would love to fight Conor McGregor in a winner-takes-all fight in a boxing match, I would absolutely love it because I would beat him to a pulp, I would hospitalize him and I’d make him go home broke too. McGregor made his professional boxing debut back in August of 2017. He stepped into the ring against undefeated Floyd Mayweather Jr. For his training camp, McGregor brought in Malignaggi as a sparring partner. However, Malignaggi left the camp after McGregor’s team leaked video footage of their sparring session. The clip showed what looked like McGregor knocking Malignaggi down with a punch. But the former boxing world champion claims he simply slipped, and McGregor’s team showed a favorable camera angle. “Mystic Mac” would go on to lose to Mayweather via 10th round TKO. While McGregor has some unfinished business with Khabib Nurmagomedov, it sounds like he wouldn’t be opposed to fighting Malignaggi either. 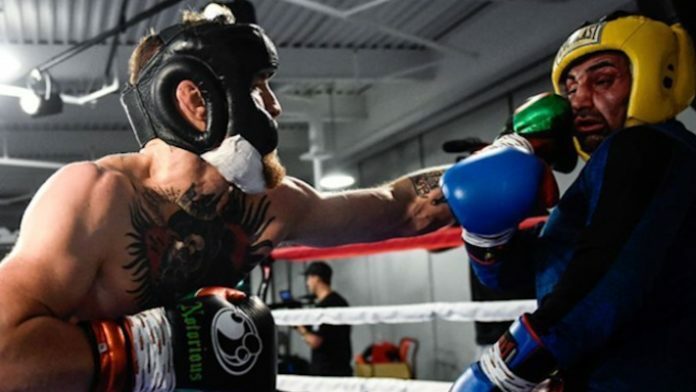 What do you think about Malignaggi’s challenge to McGregor?